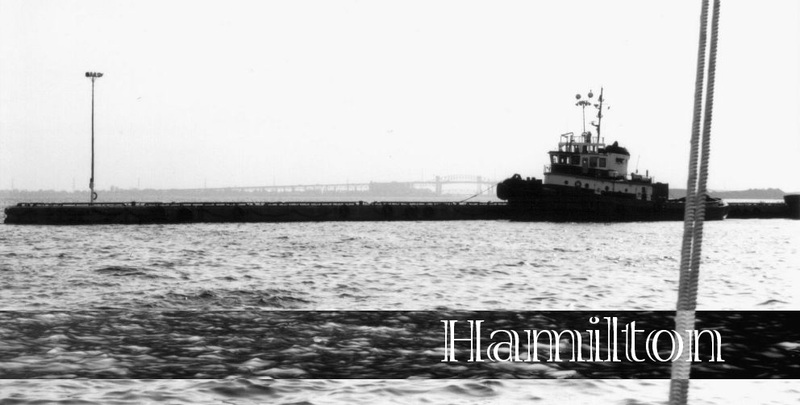 A tugboat moored at a Hamilton harbourfront pier with the massive James N. Allan Skyway Bridge looming in the distance. I’ll photograph almost anything but I have always been most interested in photojournalism and street photography, and I’ve done the latter for years without ever having any real focus in the genre. For the longest while, I was interested in shooting anything within an indoor or outdoor urban setting; any city, anywhere. I still am. I never expected my photographic art interests; however, to naturally gravitate to mainly focusing on the city of Hamilton as it has. I’ve met many who have lived in this city their entire lives, and express that they don’t really care what happens to this town. They’re just as adaptable anywhere, and if they had to live elsewhere they wouldn’t just adapt to that location, they’d actually forget about this place. I’m sure that I could adapt to living somewhere else too but I know from personal experience that I could never forget Hamilton. I lived in Hamilton in the 70’s, lived in north-central British Columbia throughout the 80’s, and then returned to Hamilton. I actually do care about what goes on here. So, instead of assuming that I know so much about “The Hammer”, as the city is nicknamed, I’m on a quest for knowledge. I want to discover what I really don’t know, and understand what really makes this town what it is. Hopefully, I’ll even figure out what I could do to make it better. A warm hug is well received on the steps of Jackson Square. The first phase involved studying and photographing the city generally between 2000 and 2009. In the late 90’s, people sounded so enthusiastic and optimistic about the world when they would refer to the incoming “New Millennium”. So I became curious as to how Hamilton endured during the first ten years of this presumed time of wonder. By the end of 2009, I ended up with a webpage that was too long and busy and probably a huge waste of bandwidth. I truncated it, moved it from the main Modes of Flight website to the main MOF blog, and now to this blog page. In spite of all that time and effort devoted that decade was actually a quick and dirty approach to urban photography of Hamilton overall; an introduction to the city, and me finding my way through street photography. Many of the pictures I made were more representational of individual landscape, architectural, landmark and documentary photography. They were also quite common. In looking at the photography of other local photographers, I found that they took pictures of many of the same things I did, and in the same way. This did not sit well with me. I realized that although I convinced myself that I was making unique images, I truly had failed to push myself as an artist to capture images that no one else would have thought to. It became necessary to do better, as I know I am quite capable of. I also don’t feel as though I did enough to showcase this much misunderstood city. This place is deeply loved by probably half of its inhabitants while condemned by the other portion. Some non-residents also throw stones at it but most of them, really, seem to ignore this city. It doesn’t exist for them. I’d like to show everybody just how interesting the City of Hamilton actually is, and how much more potential there exists. I don’t intend to do it in any typical promotion of tourism and business sort of way either. If these are the inadvertent results, fantastic but my main intent is to record Hamilton’s mundane to controversial aspects because many, not all, of these dissenting qualities give this city its wonderful character. At least in my mind they do. I am very much motivated by cultural diversity and the happenstances that most people usually take for granted. Some of the many faces and cultures you could see on any given day in “the Hammer”. Such images may have the potential to inspire others with brilliant ideas for making positive change where the change is needed. Maybe then, my photographic art will serve an ambassadorial role to people who may take a first time or renewed interest in this great Canadian city. In getting to know the city I live in, and trying to envision its future, I’ve made exploring and photographing the city of Hamilton a very personal life project. I used to call it the Steeltown Neighbourhoods Project because this was a city that was best know for it’s steel industry for nearly 100 years. I also focused on the official neighbourhoods of the city. As the health care professions have become the leading industry, the local’s continue to affectionately refer to this tough historically blue collar town by its pounding handle, and as I’m trying to use street photography, urban photography and rural photography to drive a point across (at least to myself), this is now the Hammer Home Street Photography Project. In the renewed approach, the project had three phases; one which actually began in 2007. There continues to be the aim is to explore each official neighbourhood, sector and constituent community of the city individually, starting with those of lower (below the Niagara Escarpment) Hamilton. Lower Hamilton has a particular significance to me because I find it so strange to hear that there are lifelong residents who say they haven’t been to the core or other lower city areas in a decade; give or take some years, out of some notion that lower Hamilton is rundown beyond hope and rife with danger. It would be so rewarding to me if I could show citizens and outsiders the differences that I see between areas of the same city that aren’t necessarily indications of degradation. To help get a feel of a neighbourhood and why it may have the character it does today, I will briefly research each area’s history for comparison with its present, and depict each neighbourhood through contemporary urban images. Originally, these were going to be ten-image photo essays, later on I switched to twenty. I’ve now suspended all such limitations indefinitely. He paces up and down the street, silently screaming about the world’s pain. Show the world how this city looks through my eyes. A severely intoxicated man is rousted from his sidewalk slumber. To also help me get a sense of each area in their modern states, and to try to anticipate their futures, I hope to find people from each area who are willing to share their positive and negative experiences and most frank opinions of living in their respective areas. I’m even interested in their opinions of other Hamilton areas, and the city overall. The more diverse their backgrounds, the better; they could have lived in their areas for a short time, or all their life. They could be wealthy or unemployed and on welfare, modest or a contemptible snob, well-educated or not at all, shy or blatantly exhibitionist, the epitome of peak health or terminally ill, young or old, puritanical or unapologetically crack-addicted, of any race, any ethnicity, any religious faith or atheist, any political ideology or sexual orientation. It will be interesting to see just what Hamiltonians, if any, come forward. They have the power to show who they really are, and just what this city is made of. Although telling the story of a city is probably best attempted through photojournalism, I have chosen this somewhat more creative approach by applying related street photography genres, which are in fact related to photojournalism. It’s different, less preachy for those who find photojournalism too abrasive and; after all, the related street photography genres are about the “average person” and the environment in which they work live and play. These are people and an environment that I like to think I am personally somewhat familiar with. I should make extra effort to understand them more. In assessing the scope of this project and the potential volume of work to be produced as time goes by; once I had lifted my own previously held restrictions on the number of photos to be made, I considered that the project required being spread across three separate blogs. There was to be one for Lower Hamilton, one for Hamilton Mountain and one for Rural Hamilton. It is well established that the city of Hamilton’s is divided socially as a result of the geography and economics that exists. This is a major city that is literally sheared in half by the steep Niagara Escarpment that averages 100m (330ft) in height across the municipality. To the north of the escarpment are the lower “Head of the Lake” areas that have very old and fairly-well documented histories that citizens, like me, have begun to slowly acquaint themselves with. To the south are the contemporary suburbs that continue to expand into the city’s outer area. These areas above the escarpment are what all Hamiltonian’s simply refer to as “the mountain”. Typically, the older parts of major cities anywhere in the world become actual or perceived neglected inner cities where once held opulent suburbs and business districts have become the epitomes of urban degradation. To some degree, Hamilton has not gone unscathed from this urban planning phenomenon. Despite successful semi-activist and part political efforts to maintain the livability of Lower Hamilton’s urban areas in recent years, decades of aggressive growth above the escarpment has resulted in noticeably more modern living conditions in the southern portion with the burgeoning notion there that Lower Hamilton has become a den of iniquity to be avoided. There are now citizens in the newer suburban and even rural areas above the escarpment who have expressed to local media that they haven’t ventured into the downtown areas in at least a decade. Some residents below the escarpment express bewilderment over the new suburban concern, view those of mountain suburbia as a bunch of contemptible snobs, and counter the snotty attitude by refusing to travel to the mountain areas. These are all citizens of the same city having such vehement disdain for each other. Being that Hamilton is a somewhat maligned city by others across Canada as “the stinkin’ steeltown”, one might hope that the residents would prefer to band together in an effort to make the city appear strong, unified and adequately advancing. After all, this city and its century old steel industry are in fact highly important factors in the early economic growth of the entire country of Canada. Discover diverse cultures and subcultures that I and perhaps many others are not aware of (not to criticize or hold to ridicule but to learn about and try to understand). Discover diverse cultures and subcultures that I and perhaps many others are not aware of (not to criticize of hold to ridicule but to learn about and try to understand). In spreading the project over three blogs, I did suspect that there would be less popularity with the depictions of life on the mountain in comparison to that of below the escarpment. As much as many citizens criticize the conditions and residents of Lower Hamilton, I continue to hear people from both areas say that the suburban escarpment is “boring”. That said, I expected even less interest in the goings on and images or rural living. Sure enough, by late 2013 all three blogs were merged here. Time will tell just how much more this project will evolve.